I love marrying desserts and today is a super special wedding! Funfetti Cookies and Fudge are now married into one treat: a Funfetti Cookie Fudge Bar, a sugar cookie bar filled with confetti sprinkles and cake batter flavor topped with chocolate fudge! So, February is kind of a ridiculous month around our house. It’s the shortest month, and Valentine’s Day is right smack dab in the middle. But that’s not all. My mom’s birthday was last Saturday. Jordan’s birthday is Wednesday. And it’s my Mother-in-law’s birthday month too! My MIL? Loves fudge. She really, really loves it. I have so much fun every holiday making her new flavors, although she’s told me that I can no longer bring her a whole batch, just a few pieces or she’ll eat it all. I wasn’t able to celebrate her birthday with her this year since I was out of town, but Jordan and Mel went up to visit and took along a box of these Funfetti Cookie Fudge Bars to celebrate. They’re my new favorite food baby! 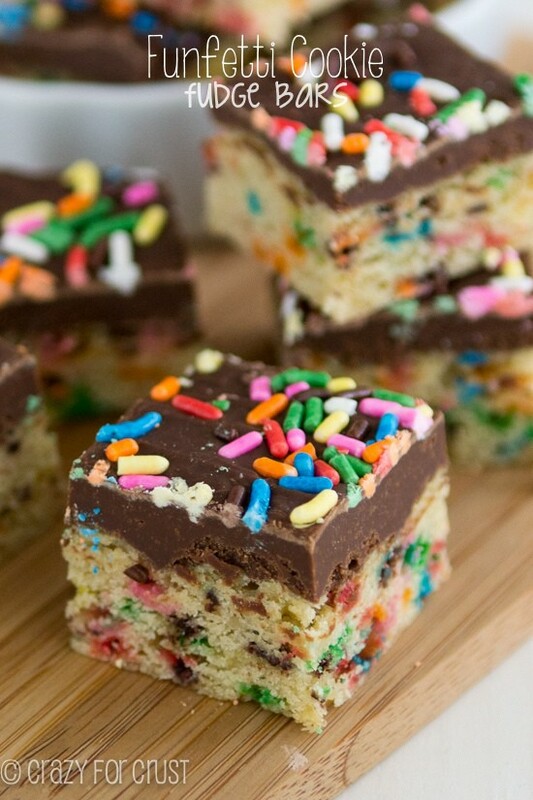 Last week I made Oreo Truffle Chocolate Chip Cookie Bars and today I’m combining funfetti cookies and fudge. Sometimes I really, really make myself happy. I think I’m addicted to funfetti. Is that a thing? I think as I get older my tastebuds get younger. Give me the taste of funfetti birthday cake any day, and I’ll be a happy girl. 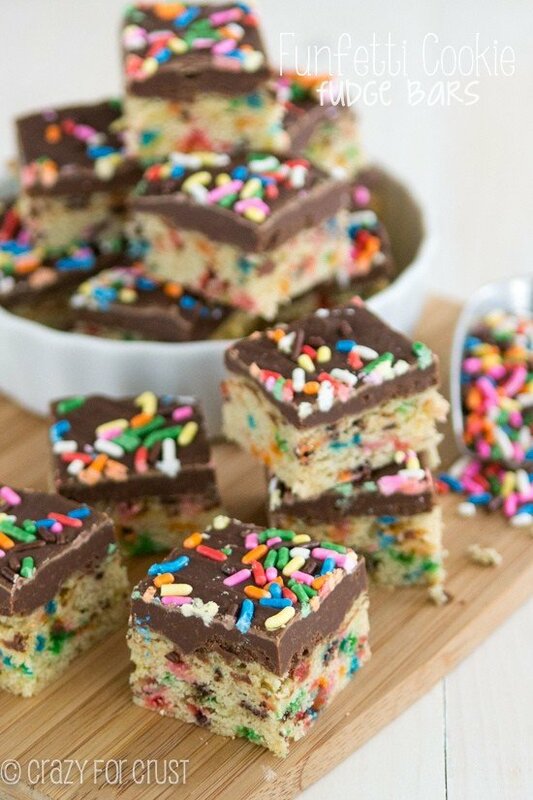 The bar cookie base for these fudge bars is made of a from-scratch funfetti cookie. As much as I love cake mix, I love creating funfetti flavor without it. You just need sprinkles and one little secret ingredient: butter extract. Just a little bit added into the batter gives a distinct cake flavor to pretty much anything. Throw in some sprinkles and you’ve got funfetti. 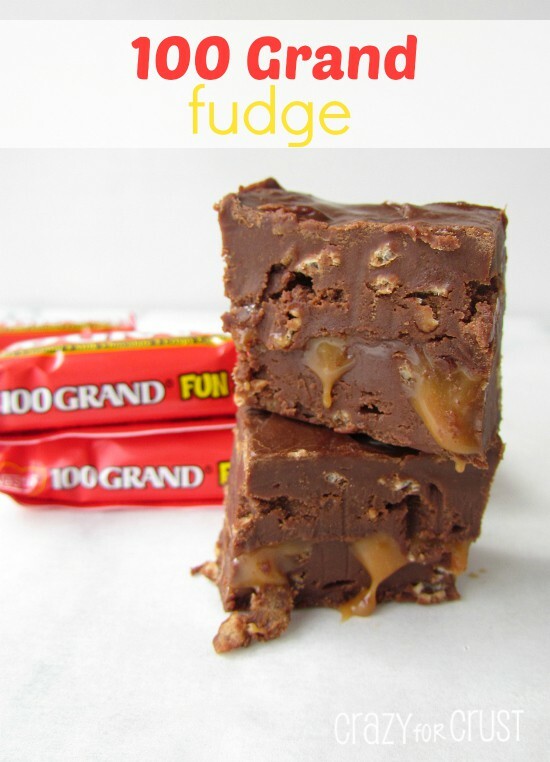 Once the bars cool, you make some fudge for the top. You can do really any flavor you want, but I went with chocolate because I love chocolate frosting on yellow cake. I think the flavors go really well together. I used an easy fudge recipe, which is pretty much the basis of all my fudges. Chocolate chips + sweetened condensed milk = Fudge. I made a half batch for these bars because the fudge would have been too thick had I not. Add some sprinkles on top and you have the perfect birthday cookie cake for anyone who loves fudge, cookies, cake, or sprinkles. These were really addicting. I dare you to stop eating at one piece. My MIL loved them, and I hope you do too! Funfetti Cookie Fudge Bar, a sugar cookie bar filled with confetti sprinkles and cake batter flavor topped with chocolate fudge! Preheat oven to 350°F. Spray a 9x9” pan with cooking spray or line with foil and spray for easy removal and clean-up. Cream butter and sugar with a hand or a stand mixer. Mix in egg, 2 teaspoons vanilla, and butter extract. Add baking soda, salt, cream of tartar and mix until combined. Slowly mix in flour and beat until smooth. Be careful not to over mix. Stir in 1/3 cup sprinkles. Press batter into prepared pan. If it’s too sticky to handle, spray your hands with cooking spray. Bake for about 17-22 minutes until the top just starts to get golden brown. (My bars to 18 minutes.) Cool completely before continuing. Once bars are cool, add chocolate chips and sweetened condensed milk to a medium saucepan. Heat over low heat, stirring constantly, until melted and smooth. Remove from heat and stir in 1/2 teaspoon vanilla extract. 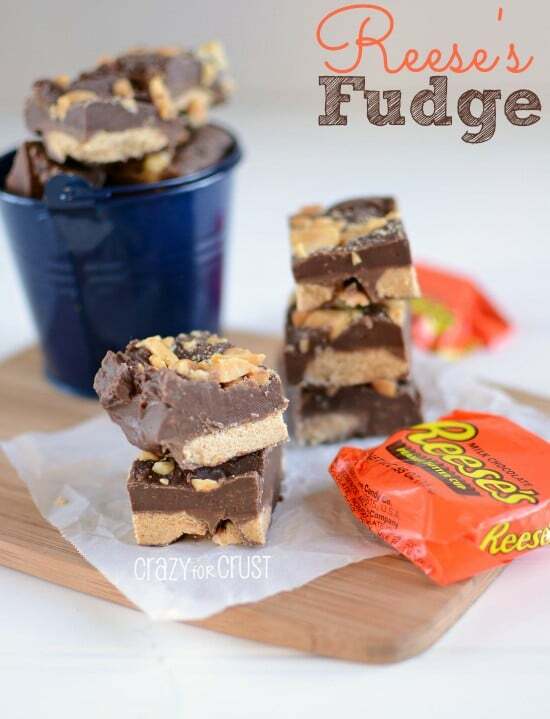 Quickly pour and spread over cooled cookie bars. 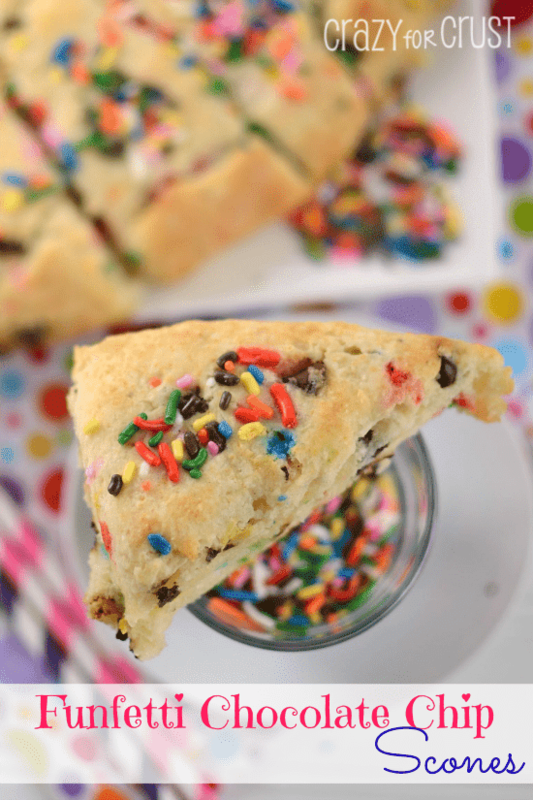 Quickly sprinkle more sprinkles on top and press lightly to adhere them to the surface. Let come to room temperature, then chill until set. Cut into squares. 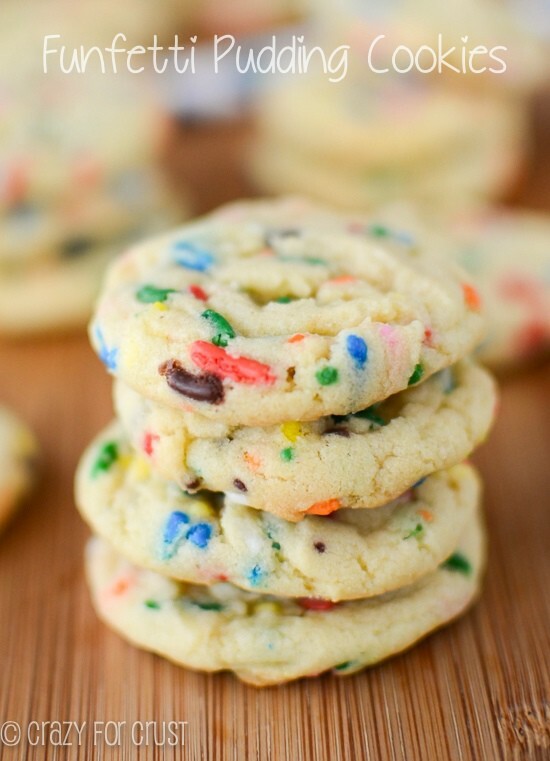 If you LOVE Funfetti, check out all my favorite recipes: Cake Batter Cookie Pie, Funfetti Cake Batter Wedding Cookies, Homemade No-Churn Funfetti Ice Cream Cake, Funfetti Gooey Butter Shortbread Bars, and Funfetti Sugar Cookie Dough Bites.